Most snake gear pants are heavy, stiff, and bulky. Using a mere 6 oz. fabric, TurtleSkin SnakeArmor snake gear pants are one-third the weight of other hunting snake gear pants yet are tested to repel even large rattlesnakes. Never has a softer pair of snake gear pants been designed. These pants feature a soft and comfortable 100% cotton shell with a TurtleSkin system built into the entire bottom from the knee down. Cool, flexible, and breathable, these upland bird hunting pants are built to last. TurtleSkin SnakeArmor's patented technology produces the tightest weave ever achieved with high-strength fibers. Its weave is locked so tightly that snake fangs can't slip past. TurtleSkin's ballistic fibers are so strong they resist breaking and fraying. U.S. Patents 5,565,264 & 5,837,623 as well as other patents pending. 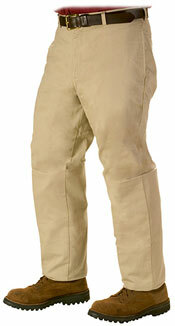 Custom-sized hunting pants are available at an additional $25.00 charge. Custom products cannot be returned.